Give feedback on the government's review in less than a minute. The government is currently reviewing Tomorrow’s Schools – the name given to the reforms that dramatically changed our schools nearly 30 years ago - and NZEI wants to make it easy for you to have your say about the future of education. 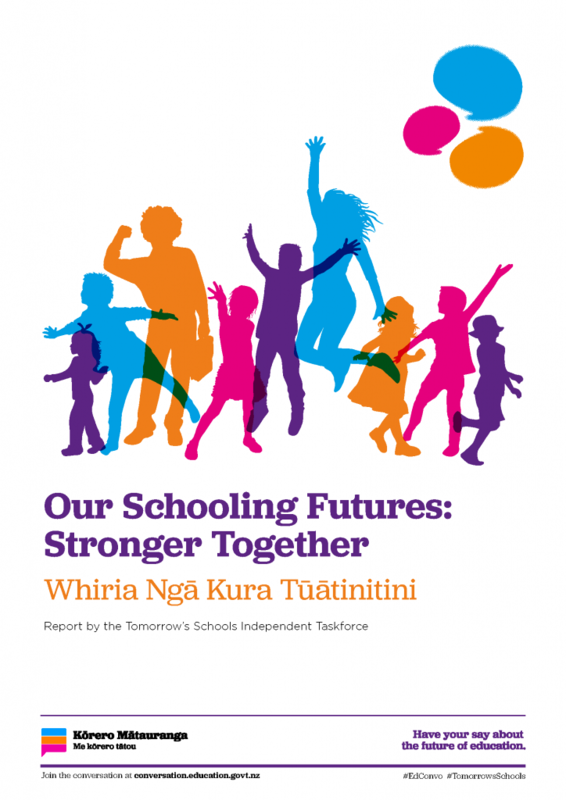 As part of this review, an independent taskforce put together a report - Our Schooling Futures, Stronger Together l Whiria Ngā Kura Tūātinitini - which is now open for public consultation. Their recommendations would represent the biggest reform of the education system in a generation, so it’s critically important that as many people as possible engage with the consultation process. We're calling on the Government to slow down the consultation, design and implementation of changes to ensure we all have a voice in shaping it. STEP 1: Read our response to the report's key points below. STEP 2: If you agree with what we've said, add your name, email and any additional comments in the form below and we'll send our submission to the Ministry in your name. If you have time, you can make a full submission via the Ministry of Education's online survey (this takes around 40 minutes to complete). The taskforce says: Overall funding for schools is insufficient. The disparity between staffing entitlements for secondary and primary schools is unwarranted and impacts negatively on teachers and learners in primary schools. NZEI says: Increased resourcing, increased support for teachers and increased support for the education workforce must underpin successful reform. Additional investment in funding and human resources, including support for leaders, boards, teachers and children, particularly those with additional learning needs, is a pre-requisite for success, regardless of changes to the system. NZEI says: We support the concept of a dedicated national hub for kaupapa Māori settings, universal access to te reo Māori and the teaching of Māori history. We support the suggestion that mana whenua be represented on school boards and that iwi representation be mandated on hub governance bodies. However, we don’t think that this alone will be sufficient to create a schooling system that is genuinely bicultural and where Māori students in every setting can flourish in their language, culture and identity. Resourcing and building capacity in teachers and schools is required to do this. NZEI says: To support culture change, hubs can’t simply be re-configurations of Ministry regional offices. For sector buy-in, independent oversight of its implementation over a reasonable timeframe is essential, as is time to engage in the process. Building trust between hubs and schools/services will be critical to the success of this approach. The taskforce says: ECE is not in the scope of this report. NZEI says: It’s essential any changes to schooling match up with changes in ECE, as early learning is the foundation for children’s learning. The report pays little attention to the way the proposed schooling hubs incorporate, link to or improve transition between ECE and schooling. Alignment changes in schooling with the Government’s 10-year ECE strategic plan including the goal of turning back the tide of privatisation in ECE is essential. The taskforce says: Principals should be on five-year contracts. NZEI says: A prerequisite for changes to the system should be that the well-being, security and quality of working conditions of educators should be enhanced not diminished. National collective agreements must be maintained and strengthened through any change process and in any new employment relationships. Hubs have the potential to provide more continuous and secure employment for educators, including para-professionals, and may facilitate stronger career pathway options and more effective professional and learning for principals, teachers and support staff. However, we believe there are also risks to the Hub model. Principals must be permanently employed, with any time limits on appointment at a school or hub unacceptable unless agreed mutually. The Taskforce's recommendations leave most support staff in insecure term-by-term employment through schools’ operations grants - this is a missed opportunity to move towards Labour’s commitment of central funding of support staff. The change process must be extended to ensure that there is sufficient public conversation to share more widely the analysis of the problems with Tomorrow’s Schools and build broader consensus around solutions. The Government must be transparent about the increased and additional resourcing that will support any transition and new structures in advance of the change process, particularly in terms of the disparity between primary and secondary school resourcing. If hubs are to proceed, the Government should consider pilot projects in a small number of areas to road-test the concept. The proposed establishment group must remain independent of the Ministry, but be expanded and resourced so that it has robust oversight of any change. Do you have any comments you want to add?